Google Tez has become the latest UPI-based payments app in the country, propelling the Internet search giant into the league of companies eyeing a piece of India’s digital payments pie. The new Google Tez app can be used to pay for movie tickets, utility bills, and make other transactions online. The company will hold a launch event for the app on Monday in New Delhi, but has made it official ahead of that. Tez means fast in Hindi, which the company said was one of the selling points of its new app. Google’s rivals such as Amazon and Facebook are also making efforts to tap the country’s digital payments market. Google Tez is a standalone payments app, available on Android and iOS, and is powered by UPI, a payments protocol built by government-backed organisation NPCI. 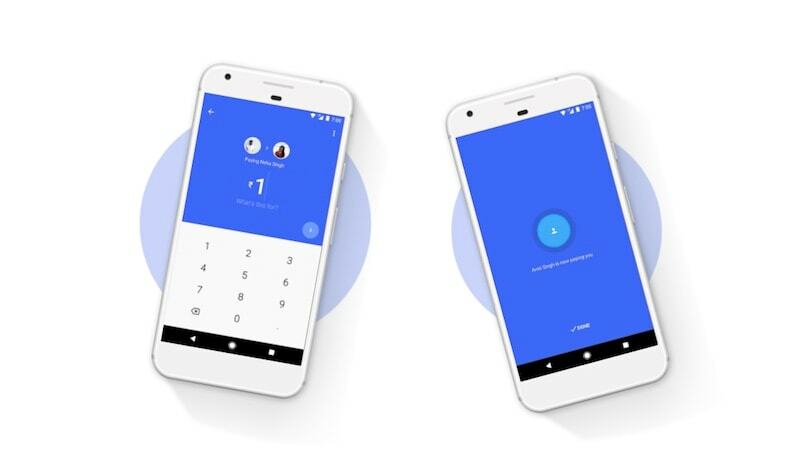 The launch of Google Tez comes nine months after the company chief executive officer Sundar Pichai told NDTV in a televised interview that he was looking at UPI and ways to adopt it. “The app weighs just 7MB on Android and works with the vast majority of Android smartphones in the country,” Caesar Sengupta, the head of Google’s Next Billion programme said onstage at the event. The app even works on Android KitKat-powered smartphones, Sengupta said. iPhone users — going as back as iPhone 4s — will be able to use Tez app as well, he added. The Google Tez UPI-enabled digital payments app supports various local languages including Hindi, Bengali, Gujarati, Kannada, Marathi, Tamil and Telugu. The interface is straightforward, and strikingly different from other payments apps, Google executives said onstage at the event. “This was deliberate. We wanted to make digital payments as simple as paying via cash,” executives said. The company asks users to enter their bank account number and verify their ownership. They can do so easily by quickly sending a text message from their registered phone number through the Google Tez app’s interface. Once verified, Google prompts the user to add a UPI PIN, and then they can start making payments. They can then see all their friends who’re also using Tez, and request and pay money. More interesting, however, is the Google Tez “Cash mode” option, which transmits “audio” using Google’s QR technology to identify the person nearby you, and lets you pay or receive money when you’re able to find that user. “It works on almost all phones sold in India,” a Google executive said at the event. The company has partnered with Axis, HDFC Bank, ICICI, and State Bank of India for backend processing. “With Cash Mode, we have made paying digitally as easy as paying via cash,” a Google executive said. Google Tez supports various Indian languages, such as Hindi, Bengali, Gujarati, Kannada, Marathi, Tamil and Telugu with more coming soon. Google has partnered with several popular services to boost its usage. Bus ticketing service RedBus, PVR Cinemas, Domino’s Pizza, DishTV and Jet Airways are launch partners, it said on the website. The company suggests users to have look out for Google Tez logo in their favourite services to see whether it is supported. The company has also introduced “Tez Scratch Cards”, and from the description it appears it will be offering customers deals and vouchers through this feature to attract them. For all transactions over Rs. 50, users will receive a scratch card — vouchers with some rupees. The company also has a business channel on its service, a feature WhatsApp recently started testing and Paytm is working on. Business channels will help customers easily find services, the company said. These businesses can then talk to the customers and give them discounts. Customers can then easily pay for the offers they avail from within the app. If you have a business, you can sign up for the service here. 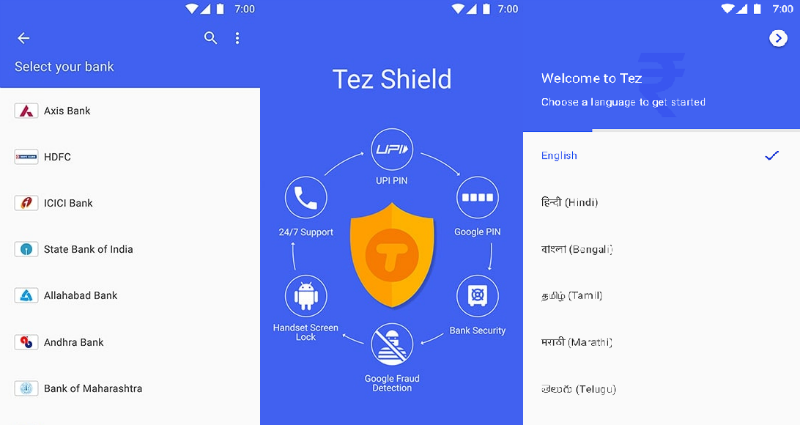 On the security front, all the transactions on Google Tez app are guarded by something called Tez Shield to “detect fraud, prevent hacking, and verify identity,” the company says. “We built Tez to provide security throughout the payment process from customer to business and back.” One thing the company has done is introduce an additional PIN layout to protect any unauthorised usage. On iOS, the app supports Touch ID. A company executive said it has taken measures to prevent any business partners from spamming their users. With Tez, Google has become the latest international giant to enter India’s increasingly growing digital payments market. Samsung in their respective services in the country this year. Amazon and Netflix are also planning to add UPI support to their respective services, people familiar with the matter said. “Google is a bit late to the game, but it is not a concern as they are still well placed in building trust with the consumer base for the growth of its payment platform,” Neha Dharia, senior analyst at Ovum told Gadgets 360, adding that digital players have realised that they need to figure out a payment mechanism as they evolve to address the next stage of consumer usage. “Players are moving to becoming platforms for a range of online and offline goods and services. Which is why it is crucial for established players to not only introduce a payment tool but also start building trust amongst consumers regarding aspects such as ease of use and security. This is why players like Google amongst others are being aggressive with the deployment of their payment tool,” she said. Google Tez’s biggest rival could be WhatsApp, which also plans to introduce support for UPI payments in its instant messaging app later this year, a person with directly knowledge of the matter said earlier. With over 200 million active users, WhatsApp is the most popular messaging app in India. Google’s services including search, Maps and Android have tremendous reach in the country as well. Google Tez app can be used to book bus and movie tickets, order food, pay bills etc. An analyst pointed out how India continues to attract the attention of global giants. “It certainly seems like India is attracting more and more localisation from big global companies lately, between Amazon’s smartphone strategy, Apple’s local manufacturing, and so on. Although arguably Apple is still doing rather less localisation in India than others, and much less than it’s doing in China,” Jan Dawson, chief analyst at Jackdaw Research told Gadgets 360. Google, in particular, has arguably done more for consumers in India than any other global technology company. From its focus on localised search features, to free Internet at public places, to make its services more appealing to the less-educated and privileged of the market, the company is increasingly pushing the reach of its services in the country. “It’s clear that the big global tech companies see India as an increasingly important market and are willing to customise products, services, and even business models to make them successful in India,” Dawson said. The sudden spike in the digital payments space from the companies comes as Indians actively look at payment methods other than cash. The government’s decision to invalidate Rs. 500 and Rs 1,000 bills last year, that at the time amounted to more than 85 percent of bills in circulation, saw a major spike in usage of digital payments apps such as Paytm and MobiKwik. India’s payments industry will grow to $500 billion by 2020, according to a study published by Google and research firm Boston Consultancy Group. Analysts at GSMA and Credit-Suisse said the government’s demonetisation move has bolstered the growth of digital payments apps usage in India. Google Tez is based on UPI, which was launched just last year, could further boost its credibility and usage among Indians. UPI has already surpassed mobile wallet apps in one key area: the amount of money exchanged. A staggering sum of Rs. 41.3 billion was exchanged using UPI platform in August, compared to 27.2 billion by mobile wallet apps, according to India’s central banking institution RBI. In terms of number of transactions, UPI stood at 16.6 million, while mobile wallet apps were at 89.7 million. For Google, Tez could be another test to explore how quickly and widely its payments app gains traction. The company’s earlier attempts such as Google Wallet and Android Pay are popular among customers, but they are struggling behind Apple Pay and Samsung Pay. The company started to look for people in India for its Google Tez app last year, according to recruitment posts on its website. Apple Pay is at present not available in India.